The Malaysian Armed Forces Chinese Veterans Association (MACVA) was invited by TARUC to participate in their Military Career Talk and Career Fair on 13 Mar and 20 Mar 2018. 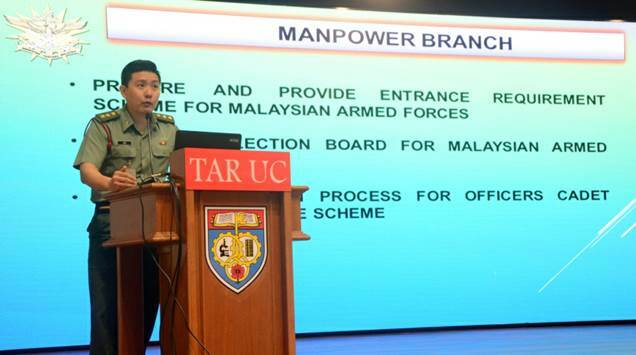 This is the second Military Career Talk and the fifth Career Fair that MACVA is participating in TARUC, a joint effort with the Recruiting Team from Human Resource Division, Ministry of Defence (HRD MINDEF) since our first meeting on 27 Oct 2016. A total of about 100 odd undergraduates from the Account, Finance and Commerce Faculty visited the fairs. 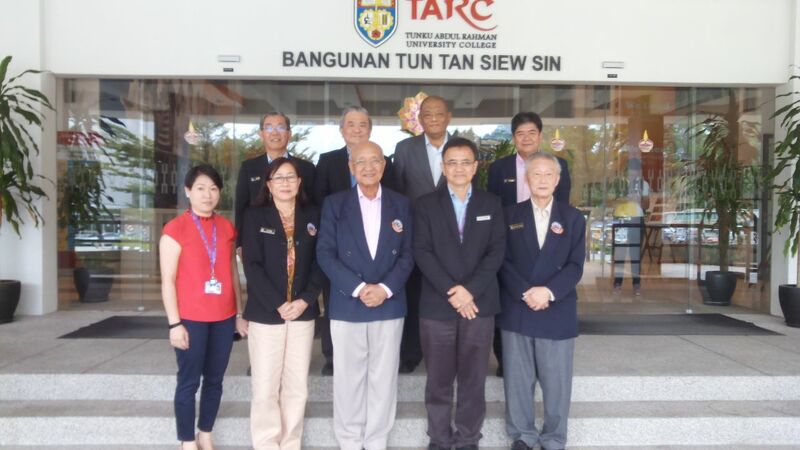 MACVA First Meeting with TARUC on 27 Oct 2016.First Row from L to R: Ms See Gim Ling, Asst Registra Office of the President, Lt Col Carol Loo (Rtd), CYR Project Leader, Lt Col Dato’ Martin Kam (Rtd), Adviser, Dr Chook Ka Joo, VP Student Affairs & Quality Assurance, Chairman of the meeting, BG Dr Leong WF (Rtd), MACVA Protem President. Back Row from L to R: Maj David Chow (Rtd) CYR team member, Dr Oo Pou San, Director of Continuing and Professional Education, Mr Lee Hwee Chuin, Legal Advisor, Office of the President, Lt Col Chua EL (Rtd), Youth Development Program Project Leader. The Military Career Talk conducted at the Auditorium, Bangunan Tun Tan Siew Sin on 13 Mar 2018. On arrival, both the teams from MINDEF and MACVA were ushered by the staff to the auditorium followed by the opening speech by Mr Harry Goh Keng Siong, Deputy Director of the Student Affairs. 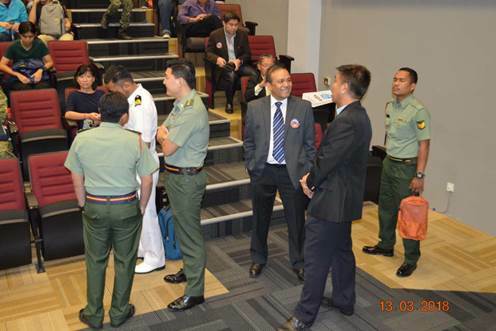 Interaction of MINDEF officers and MarVs upon arrival. Opening remarks by Mr Harry Goh from TARUC. The first part of the talk was headed by Capt Lim Weng Hock, from the Royal Armored Corps, he also represented HRD, MINDEF. 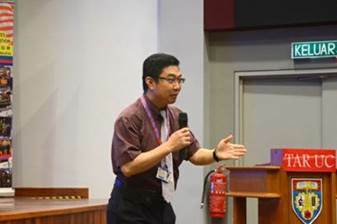 His talk mainly covered the basic requirements, terms and conditions, pay and allowances for the Graduate Scheme and also his personal career path in the Armed Forces after graduating from UPNM. Capt Lim Weng Hock during his presentation. The second part of the talk was focus on the experiences and success stories after retirement by the MarVs. A brief introduction to the four speakers was done by the CYR Team Leader, Lt Col Carol Loo (Rtd). The talk was headed by MACVA President, Maj Tan Paosan (Rtd), followed by Commander (Cdr) Saw Chuan Hin RMN (Rtd), Maj Anthony Yeap (Rtd) and Maj Chandra Mohan RMAF (Rtd). All speakers were able to capture the audience’s attention especially those who are still actively involved in the TARUC Territorial Army. This time around, we could see more students during the Q & A session seeking clarification and information about the career path for the Armed Forces. The CYR Team Leader, Lt Col Carol Loo (Rtd). Maj Tan Paosan (Rtd), President of MACVA relating his experiences during and after his service. Cdr Saw Chuan Hin RMN (Rtd) relating his working experiences. During Q & A session. Question posed by one of the undergraduates from the Territorial Army. The program ended with the exchange of gifts. MACVA President presented the second edition of MACVA booklets to Mr Tan Seng Seng, Deputy Director, and Department of Student Affairs. Exchanging of girts between Maj Tan Paosan (Rtd) and Mr Tan Seng Seng. Gift presentation by Mr Tan Seng Seng to Capt Lim Weng Hock. TARUC Career Fair was conducted on 20 Mar 2018 at Dewan Utama. About 30 finance related companies participated in this fair. MACVA and HRD MINDEF were again invited (the fifth time), at no cost. Setting up and ready for the fair. MACVA CYR Team. From L to R. Andrew Teoh, Phua HS, Carol Loo (Team Leader), Tony Ho, David Chow and Ong YC. Joint MACVA/HRD MINDEF Team. L to R. Ong YC, WO2 Sufian, Lt Mohd Faiz RMN, Sgt Muhammad Firdaus, Lt Shafiq RMN, Carol Loo, David Chow and Tony Ho. First ‘candidate’ to enquire about the Graduate Scheme. Maj Andrew Teoh (Rtd) was giving career guidance talk to the undergraduates and ended up with a group photo. Tony Ho and David Chow are busying talking to the undergraduates. The turnout this time around, is only about 100 odd undergraduates from the Finance, Account and Commerce Faculty. The number though small as compared to the previous ones, we could see more students coming forward and inquisitive. There were some, they still needs to be cajoled and led to our booths, probably that shy or have a ‘taboo’ to see people in uniform. Those who came voluntarily were asked to fill up their name, contact number, year of graduation for follow up action from HRD MINDEF. During the visit of the Board Members, the VP himself, Dr Chook indicated to us that he would assist us in talking to his counterpart in UTAR. He will try to convince his counterpart to have the similar arrangement that we have with TARUC now. Group photo with the Vice President of Student Affairs and Quality Assurance, Dr Chook Ka Joo (6th from the left). To conclude, the milestone that we have reached since we started our first meeting with TARUC on 27 Oct 2016 is remarkable. We only hope that with the combined effort from TARUC, HRD MINDEF and MACVA, the seed we are sowing will germinate and to see the result in the near future.